Is the Bathroom Easy for Your Senior to Access? You might not realize it, but having easy and safe access to the bathroom can be vital for your aging adult. Here are some simple ways you can ensure that it’s easy for your elderly family member to get to the bathroom without issues. Clutter is one of the biggest culprits in keeping your aging adult from getting where she needs to go. Clutter can trip your senior up and it can completely block the pathway she needs to take. It’s insidious and can creep up before you realize it. If you can stay on guard for clutter, a good bit of the battle is already won. Lighting is also important because if your senior can’t see well, obstacles may seem to pop up out of nowhere. Remembering to turn lights on and off is complicated, though, so you might want to consider different types of lighting. Motion-sensitive lighting is incredibly helpful because it’s automatic. Night lights can make it easier for your senior to see at night or in the late afternoon. Stick-on lights that she can bump with her elbow are easy to operate. Besides clutter, other tripping hazards can include your senior’s flooring, carpeting, or throw rugs, too. Make sure that they’re not slippery against the floor and that there aren’t holes or worn spots that can trip your elderly family member on her way by. Carpet tape can help, but rubberized backings may even be better. Some homes have raised thresholds between rooms, which may not be a big deal for your aging adult for a long time. If her mobility becomes compromised, however, or if her vision becomes an issue, these raised thresholds can become a tripping hazard very easily. Some can be removed or improved by a handyman, which might be a good idea. Some aging adults may find their own homes become unfamiliar when cognitive issues start to show up. In those instances, it might be wise to post a sign labeling the bathroom clearly. It can even help to post signs on the way to the bathroom that help your elderly family member to navigate from common areas to the nearest bathroom. You might want to go through some of these steps every few weeks or so, just to make sure that the bathroom is still accessible for your elderly family member. 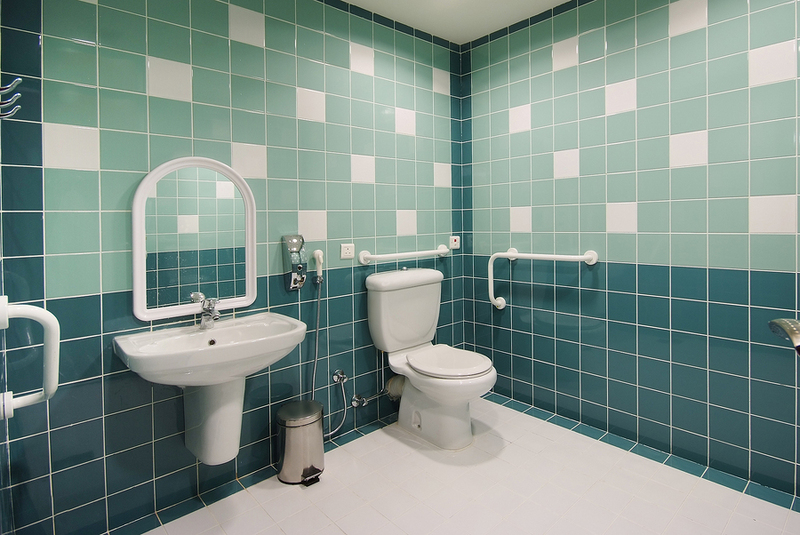 Having you or senior care providers available to assist her in getting to the bathroom is also extremely helpful, especially if your senior’s mobility is compromised.